Typically when you are in your garden and you see a bug crawling around on the leaf of one of your vegetables or flowers, you’re just going to assume it’s the same one that is putting holes in the plant leaves while you’re asleep at night. While nine times out of ten you will probably be correct, there are some bugs that are good for your garden, and you may have been unfairly punishing them. Insects are known for destroying gardens, but there are some insects that are actually helping your garden. Here is a small list of the insects that you might not want to squash next time you see them. You more than likely know of this beneficial bug as a “ladybug”, a commonly prized catch for children playing outside in the summer. While lady beetles have always been thought of as a fun little bug for children to catch and play with or a sign of good luck when one lands on you, they are extremely beneficial to human interests. Acting as a form of residential pest control for your garden, lady beetles are an unquenchable predator of insects like aphids, scales, spider mites and plenty of other Sacramento area garden pests. If you don’t have many lady beetles in your garden you don’t have to worry, as plenty of magazines and home-garden stores sell lady beetles marketed as “garden pest control”. While these little red bugs will indubitably tear apart the insect pests that they find in your garden, they might not stick around for long. Like most things, lady beetle will go to wherever the food source is, so if they run out of pests in your garden, they might just move on to your neighbors garden. The green lacewing is one of the most beneficial garden insects that you could hope to have hanging around your plants. Adult green lacewings feed on pollen, nectar, and honeydew, flying around at night from plant to plant. You’re probably thinking “If they feed on pollen and nectar why would they be good for my garden?” and you’re right, that wouldn’t do much for you if that’s all they ate. While adult green lacewings eat pollen and nectar, the larvae are not so peaceful. Green lacewing larvae are known as “aphid lions” because… well… They stalk and eat aphids, ripping them apart with their sickle-shaped jaws. Aphid lions are also known to prey on mealy-bugs, spider mites, leafhopper nymphs, scales, and many more unfortunate pests. As far as pest management goes, green lacewings might be one of the best pest exterminators that your garden could ask for. Much like the lady beetle, green lacewings are also sold at home-garden stores as garden pest control supplements. After buying a couple “aphid lions” your garden will be a pest free environment. Commonly mistaken for bees and wasps, the syrphid fly is actually a beneficial insect to gardens everywhere. While it might be hard to think of a fly as a beneficial bug when mostly every experience you’ve ever had with flies has been negative or annoying, but syrphid flies are extremely beneficial insects to your home garden. The syrphid fly is a pollinator, as it moves flower to flower in search of nectar, moving pollen with each landing. But the benefits to your garden don’t stop there! Syrphid flies lay their eggs on the leaves and petals of plants and once they hatch the larvae consume aphids. The larvae are extremely effective at pest management, with each larvae eating close to 400 aphids before they become adults. Unlike the lady beetle and the green lacewing, you cannot buy the syrphid fly in a home-gardening store, so if you see one in your garden, just be happy that you have one! One of the more interesting defenders of the garden is the parasitic wasp. The parasitic wasps are known for laying their eggs in pest insects so that when their eggs hatch, the young can feed on the insect. There are three main families of parasitic wasps, and they are all slightly different. This family of wasps can be found in gardens worldwide feeding on pollen and nectar from small flowers. The adult wasp lays its eggs in the back of grubs and caterpillars so that the larvae will have food when they hatch. Braconid wasps typically kill garden pests like aphids, moths, beetles, cutworms, cabbage worms, caterpillars, and hornworms. Chalcid wasps are very similar to the Braconid wasp, but instead of eating pollen and nectar, it is common for the adult wasps to eat plant tissue from stems and leaves. While this family of wasp is slightly destructive, they sure make up for it with their young. Much like the Braconid wasp, the chalcid wasp lays its eggs in insects and arachnids, eliminating the pests from your garden. The largest family of the three, the ichneumon wasps are named after the Greek words for “tracker” and “footprint” and tracking down prey is exactly what they do. You might not find this family of wasps in your garden too often as its likely tracking down the larvae of a wood-boring insect to lay its eggs inside. While slightly different than the other families of parasitic wasps, the ichneumon wasp is still a pest control specialist. While some of the other bugs that we have talked about today may have been a surprise benefit to your garden, that is not the case with spiders. Spiders are excellent hunters and will eat almost any bug that falls into its web. Usually, peoples, instinct is to kill spiders when they see them, and honestly, we can’t blame you, but if you see them in your garden you might just want to let them hang around. After all, the best pest control is pest control that you don’t have to do yourself! It’s simple. Call us. 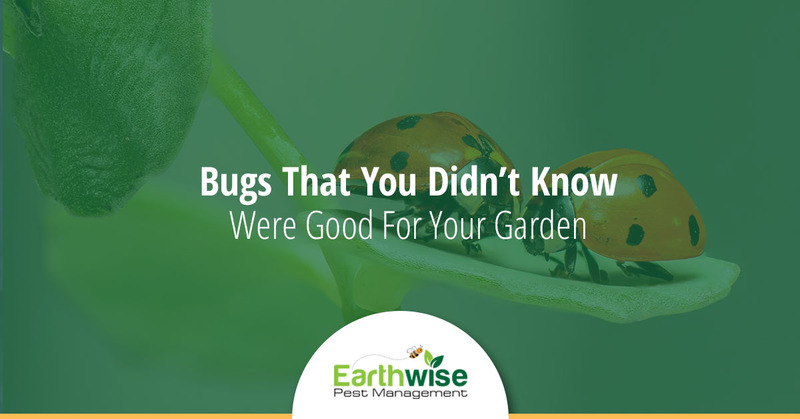 At Earthwise Pest Management we are all for letting insects do the pest management in the garden, but it’s our job to make sure that the garden is where they stay. If you have pests in your home call us for a free quote, and then relax while one of our professionally licensed pest exterminators take care of the rest! Let us show you what the best pest control experience feels like! Let the good bugs defend your garden, and let us defend your home.